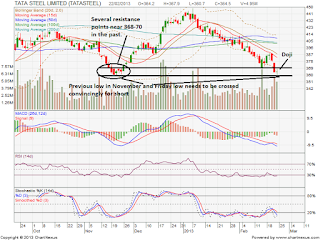 I have been maintaining bearish view on Tata Steel for several weeks now and the stock has fallen from 400 to 364. Now what will happen. Though I maintain bearish view, there is a bit of indecisiveness in the stocks daily chart. This is indicated by the Doji (almost equal legged) formed in daily charts on 22 Feb. What does this mean ? On that trading day, bears tried to bring the stock down to 360 levels, however they were not successful. Bulls tried to take the stock above 368, that was also not successful. Hence the opening and closing prices on Friday were almost the same. Even if you are day trading, it is important to view the big picture In the longer term charts, a low was formed in November at 360. Friday’s low was also at this level. So this level is very important. Below 360, 346 is the target. If 346 is crossed, then 335. Please note these levels in your trading diary. Daily pivot point is at around 364, which again is not giving any pointers for Mondays trades. So Technically Tata Steel may be traded above 368 for long and below 360 with good volumes and sustain for a short. 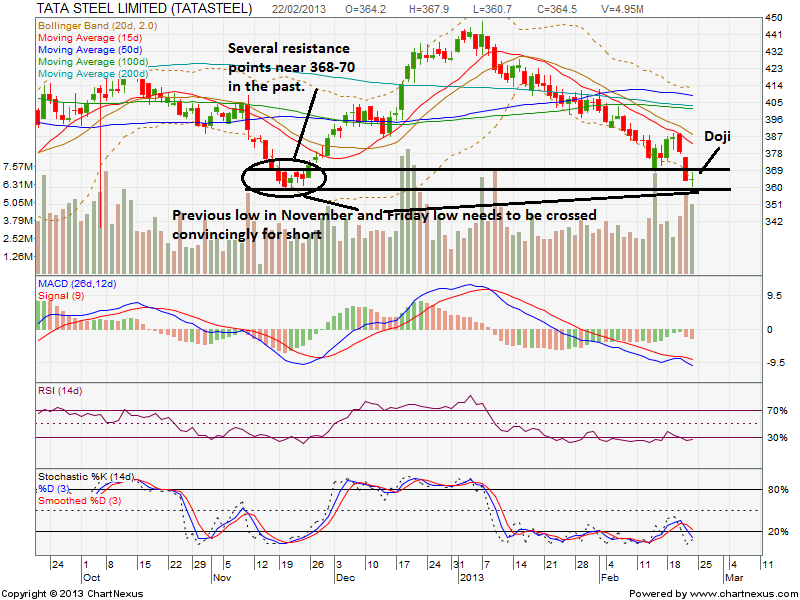 If you are a risky trader a short may be considered if Tata Steel reverses from 368-70 levels. As you can see in the chart, this band of 360-368 is a repeat of November low, which is another interesting observation. (indicated by circle in the chart). Action was seen in this band in September 2012 and also in Jan. This analysis is just psychology and simple with no indicators ! !